Anyone who has looked at the systems design of a superyacht project can’t help but be impressed at the geometric dexterity required to map out the complex pipe runs involved. From fuel and hydraulic lines to fire suppression and basic plumbing, it’s a three-dimensional mash-up that offers itself to designers and engineers like the most fiendish computer puzzle game on steroids. The problem, of course, extends well beyond the conceptual design and layout of the piping – it also lies directly in the practical construction and maintenance of those systems. At some point you have to commit to the schematic and start welding the pipes together, but inevitably there are changes further down the line that mean systems need to be tweaked, moved or adjusted. Enter Bonlok and it’s patented non-weld system for pipe fitting, which removes the need for hotwork and allows the ultimate flexibility when designing or maintaining piping on any vessel. The brainchild of Swiss engineer Gottfried Haener, the Bonlok system essentially uses a cleverly designed sleeve to join lengths of metal pipe together through use of a portable press. It is, at a base level, equivalent to a domestic push-fit plumbing system but taken to a commercial grade that means the resulting joins have been certified to at least 400 bar pressure. 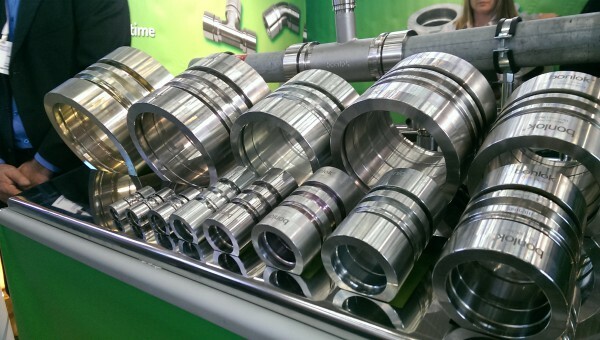 Moreover, with the system designed for pipes of 4mm to 150mm (0.25in to 6in) and with thousands of fittings – including Ts, Xs, elbows, male and female thread ends, and more – Bonlok believes it offers a complete solution that will attract the interest of anyone from designers to onboard engineers. “One of the great things is that you don’t have to commit to pressing straight away,” says David Hicks – director, CCO and global brand manager for Bonlok. “You can put a whole pipe run in place, then take it away and powder coat it or paint it, and you don’t have to commit to pressing it until the last minute.” That also means that last-minute changes to the system – or perhaps when access is required to an element behind that would normally require a welded pipe section to be cut out – can be carried out without impacting on time or cost. In addition, the fact that the joins are made using a portable hydraulic press means no hotworks, which in turn means that gas or fuel does not need to be completely drained and a gas-free certificate is not required before installation or repair work is undertaken. Ease of use is further enhanced with specialist tools like what Bonlok describes as the Goldilocks gauge. This pattern gauge is cleverly designed to allow you to check that the pipe and fitting are neither too large or too small, ensuring a perfect seal. Moreover, the Bonlok system has been fully type approved and certified by the key classification societies such as Lloyd’s, DNV GL and ABS.